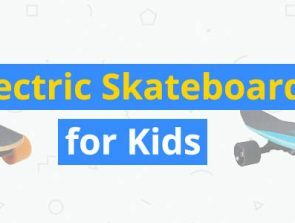 Electric skateboards are a great way to get to work or school. They help you avoid traffic jams so you arrive on time. However, not all skateboards are the same. Some have different operating ranges. The range refers to the distance a skateboard can take on a single battery charge. It is one of the most important factors a rider should consider when buying an electric skateboard. The Skatebolt Tornado is an electric skateboard that can go up to 18.6 miles per charge. It uses a 42V, 6600 mAh battery that fully charges in 2-4 hours. 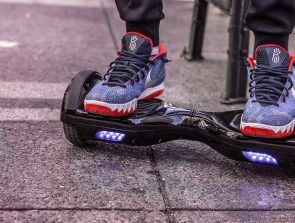 It has dual 1000W hub motors that power the board to climb 25-degree inclines and reach the top speeds of 25 mph. It also comes with upgraded brakes for smooth transitions so you don’t accidentally fall off when you decelerate to stop. The deck is stiff with a 9-ply maple so you can get the best control even at high speeds. The 3.5-inch wheels offer excellent traction in the dirt or on the pavement. It also includes a rough grip tape to give you a secure foothold when you need it. The board is light enough at 19.5 lbs that you can pick it up easily when you transition from skateboarding to walking. It also features two red warning taillights so you can travel the streets safely at night. Although it’s more expensive than the Skatebolt Tornado, the Carbon GT 2-in-1 fulfills its promise of top-shelf performance for its riders. It is a paragon of power, performance, and versatility. 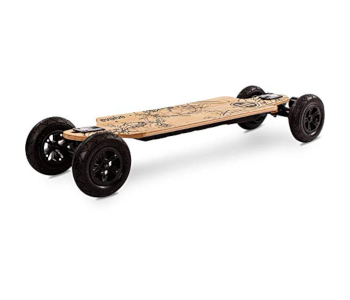 The electric skateboard boasts a 3000W dual brushless motor that reaches speeds of up to 26 mph. It is also powerful enough to climb a 25% gradient. The Carbon GT 2-in-1 features an 83mm hybrid GT Series wheel that you can switch to All-Terrain wheels, allowing you to use the skateboard on any terrain. 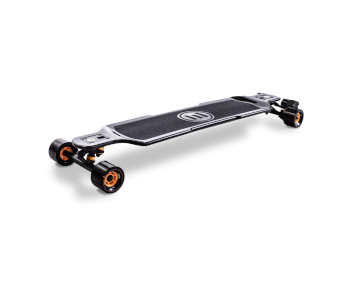 Its deck is a beautifully-designed GT carbon fiber with built-in electronics for improved control and stability. 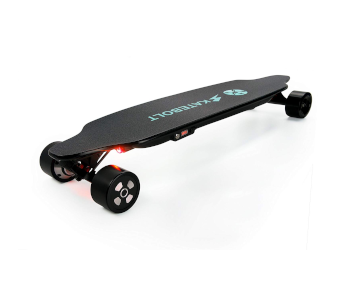 It comes with a powerful lithium-ion battery that gives the board a range of up to 18.6 miles per charge. It also has an unrivaled 31-mile range using the Street setup. 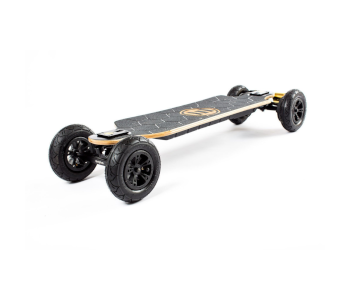 The Evolve Bamboo GT 2-in-1 is a more affordable electric skateboard compared to its carbon fiber counterpart. 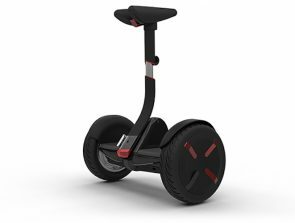 It features the same 3000W dual brushless motor power and 83mm hybrid GT Series wheels to take you up to 26 miles per hour. You can also switch to the 7” pneumatic AT wheels for an off-road experience. The Bamboo GT uses a powerful lithium-ion battery and reaches a range of 21.7 miles per charge. It also sports a Gen2 deck for a more comfortable locked-in feeling as you ride the board. It has a medium flex to give you a much smoother ride. Overall, the electric skateboard has a traditional longboard style paired with new technology for unparalleled riding performance. The Bamboo GTX All Terrain is the perfect combination of the Evolve Bamboo GT and Carbon GT. It has the high-performance attributes of the Carbon GT and features of the slick-looking Bamboo GT deck. 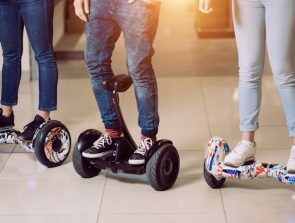 It boasts a 3000W motor capable of reaching a speed of 22 mph and a massive lithium battery that allows you to travel up to 18.6 miles on a single charge. The Bamboo GTX also offers more riding modes. The “SLOW” mode is perfect for beginners. It is easy to control and limits the top speed. The “ECO” mode provides an unparalleled range and a relaxed ride. You can also switch to “FAST” mode to skip traffic on your way to work. The “GT” mode, on the other hand, has insane power and acceleration. It allows you to climb hills with a 25% gradient. Electric skateboards are not just for fun. They can serve as a convenient means of transportation. Many students and workers use them for their daily commutes, so every bit of range helps.